Report: Obama White House OK'd Spying On Other Leaders : The Two-Way While there are reports that the president didn't know until recently that the NSA had been listening to other leaders' cellphone calls, some intelligence officials tell the Los Angeles Times that Obama's top aides knew what was going on. 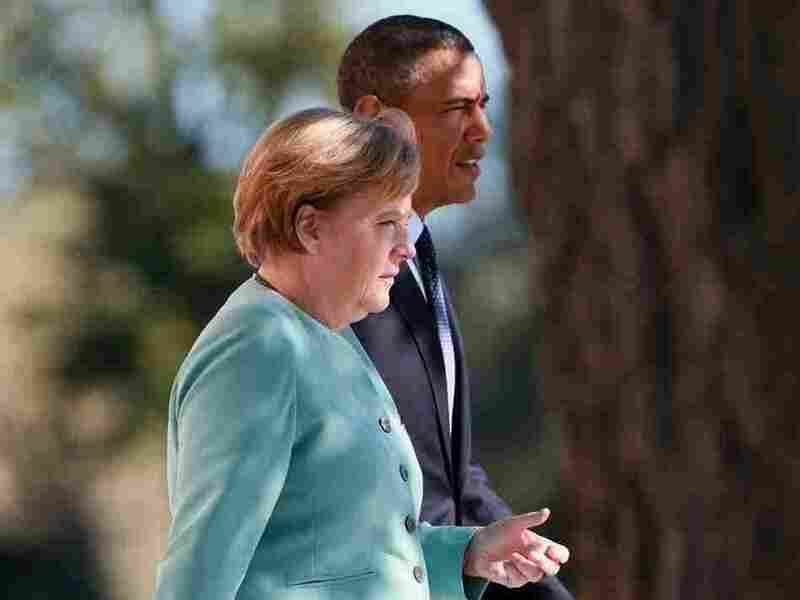 German Chancellor Angela Merkel and President Obama in September at the G20 summit in Russia. She and other leaders have objected after hearing that the NSA was listening to their phone calls. "The White House and State Department signed off on surveillance targeting phone conversations of friendly foreign leaders, current and former U.S. intelligence officials said Monday, pushing back against assertions that President Obama and his aides were unaware of the high-level eavesdropping." "Professional staff members at the National Security Agency and other U.S. intelligence agencies are angry, these officials say, believing the president has cast them adrift as he tries to distance himself from the disclosures by former NSA contractor Edward Snowden that have strained ties with close allies." This story follows word Monday, as CNN reports, that Senate Intelligence Committee Chairman Sen. Dianne Feinstein, D-Calif., says Obama did not know until recently the U.S. was eavesdropping on cellphone calls made by German Chancellor Angela Merkel and other leaders. "Obama may not have been specifically briefed on NSA operations targeting a foreign leader's cellphone or email communications, one of the officials said. 'But certainly the National Security Council and senior people across the intelligence community knew exactly what was going on, and to suggest otherwise is ridiculous.' "
Meanwhile, as USA Today says, the Obama administration is reviewing its policy about spying on allies. The New York Times says Obama is "poised to order" the NSA to stop spying on friendly leaders.